Round little balls of potato fried in butter make a cute side dish to pulled pork in this great Sunday roast recipe. For the roast pork, preheat the oven to 150C/300F/Gas 2. Score the skin of the pork with a sharp knife in a diamond pattern. 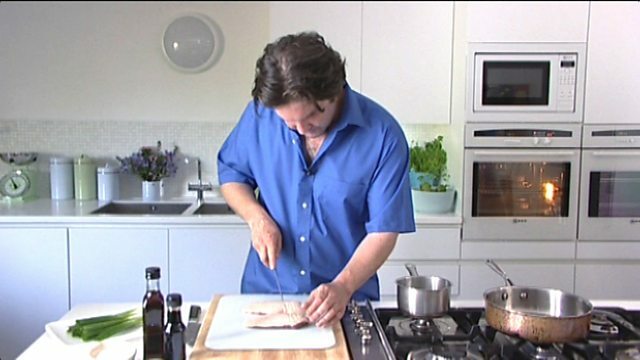 Rub the salt over the pork skin and squeeze the lemon juice and thyme leaves over too. Season with pepper. Place the onions, and butter in the base of a deep-sided roasting tray with 600ml/1 pint 1fl oz water. Cover with foil and roast in the oven for three hours. For the glazed carrots, heat a large pan and add 200ml/7fl oz water, half of the butter and all of the sugar. Once the butter and sugar have melted, add the carrots and cook for 10-15 minutes, or until the carrots are just tender. Remove from the heat. Heat a separate large frying pan and add the rest of the butter. Cut the carrots in half and pan fry until the carrot has caramelised. Heat a large saucepan of boiling water and add the asparagus. Cook for a minute then drain and plunge into ice-cold water. Heat the butter in a frying pan and pan fry the asparagus until golden-brown. For the Parisienne potatoes, using a Parisienne scoop, scoop small balls out of the potatoes. Heat a frying pan until hot, add the butter and potatoes and fry for 4-5 minutes, or until just golden-brown and tender. For the Oxford sauce, heat a large pan and add the butter. Once melted add the shallots and cook until soft. Place the orange and lemon zest and juice in a medium saucepan and add the sugar and 100ml/3½fl oz of water. Cook for a couple of minutes and strain. Add the zest to the shallots. Stir in the remaining ingredients and cook for 4-5 minutes, or until the sauce is thick. To serve, using a spoon and fork, tear the meat from the pork shoulder and pile onto a plate. Serve the potatoes and carrots next to the meat and the sauce poured over.